Founded by Rajput Prince Rao Bika in 1488 AD, who came from the family of Jodha, founder of the city of Jodhpur in 1459 AD, this desert town is blessed with much more than one beholds. Location : Bikaner is a small city located in the north-west part of Rajasthan with Jaisalmer in the west and Shri Ganganagar in the north. It is at a distance of around 460 km from Delhi and 320 km from Jaipur. Climate : Being a desert area, the city faces hot and dry whether for most part of the year with temperature ranging from 46 degrees during daytime in summers to 22-24 degree Celsius in winters but the night temperature during the winter season touches as low as 1 degree censius. 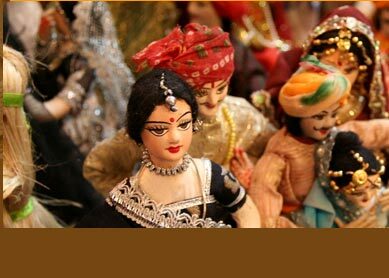 Known For : Junagarh Fort, camel race, sand dunes, handicrafts and lip-smacking delicacies mainly bhujia. 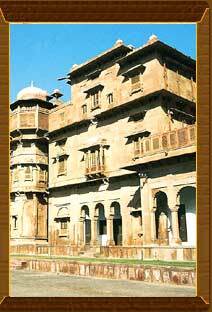 Best Time for Visit : September to March are the ideal months to visit Bikaner. Junagarh Fort :The major attraction of the city is the Bikaner Fort or the Junagarh Fort which was built by Raja Rai Singh, who ruled the city during the 16th century AD. This majestic and invincible fortress houses many palaces of red sandstone including the Phool Mahal or Flower Palace, Karan Mahal and Anup Mahal. Chandra Mahal or the Moon Palace which is the most stunning of all. The Fort also has a temple where the royal family used to offer prayers and a museum that preserves many precious artifacts. Lalgarh Palace :To experience the royal life while staying in a palace is now possible as the Lalgarh Palace now serves as a hotel. While a stay here you can enjoy the green courtyards, lawns, a view of peacocks and also appreciate a conglomeration of the past in the fourth largest library in the world and a museum called Shri Sadul Museum, that the palace houses. 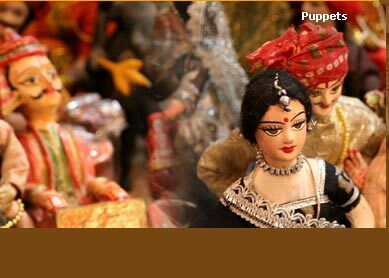 It preserves Sanskrit scripts, paintings, miniatures, weaponry and manuscripts. Gajner Palace And Wildlife Sanctuary :Just 32 km from the main city of Bikaner, this Palace offers the grandiose and lavishness of vast terrains which made it a summer palace for the Royals with a hunting ground that is now converted into the Gajner sanctuary. It is well maintained and has several varieties of Chinkara, neelgai, blackbucks and wild boars among other animal species. Kalibagan :A historic site of archaeological importance, this place preserves the culture of the Pre-Harappan era. Mata Karni Temple :Situated in the Deshnok village, 30 km from Bikaner, it is the temple of Mata Karni, an incarnation of Goddess Durga. The specialty of this temple is that it is home to thousand of brown rats that roam fearlessly around the temple campus and people believe that they are descendents of the Charan clan and for this reason, they are worshipped and offered food. The beautiful temple is made of marvel and adorned with silver gates at its facade. Bhandeshwari Jain Temple :One of the oldest temples of Rajasthan and oldest in Bikaner, the temple dates back to the 15th Century, beautiful ornamented with frescoes. Prachina Museum, Ganga Singh Museum, Sadul Museum and the Rajasthan State Archives are repositories of the fine past of ancient art and culture. Ranjing from the coins to weaponry and from paintings to pottery, the memoirs of the bygone era are all carefully preserved and represented. Kote Gate : For a shopping spree in the desert city, you can have Kote Gate as the best option. One can shop for a variety of leather goods, mirror work items, embroidery work, Painting, Bikaneri namkeens and bhujias and don't forget to taste the camel milk tea. Camel Fair : The famous Camel Festival takes place in the month of January every year. One can see the humped back, skinny horses of the desert heavily jeweled and ornamented with gorbandhs and trinkets, enjoy the fragrance of tradition in the handicraft stalls, appreciate the liveliness in the arid lands as you watch the folk dance performances, watch the breath taking fire-dance and try you hand at juggling. Not just the activities, the other thing that keeps you enthralled is the happiness and enthusiasm galore of the locals who wait for this festival throughout the year. Kolayat Festival : An important festival of religious significance to Hindus, it is celebrated with great belief, faith and enthusiasm in the month of November every year. Devotees gather to complete the religious customs on the shores of Kolayat Lake in Bikaner, light lamps and offer prayers, that presents a spectacular dazzling view from the 52 ghats of the Lake. Gangaur Festival : A complete authentic view of Rajasthan dazzles up in the month of March/April, as married women and girls dress up in colorful ghagras and bejewel themselves in silver ornaments, carry a series of earthen pots and lamps on their heads and pray to Goddess Parvati to bless their husbands with a long life. The glitter of lamps and the rythm of the folk song accompanied by pure faith in the customs as the women fast and offer prayers, really creates festivity in Bikaner. Air :Jodhpur Airport is the nearest domestic Airport to the city which connects it to Delhi and other cities. Rail :Kalka Express and Bikaner Express are the major trains that connect Bikaner to major northern cities of India by railway routes. Road : Bikaner Is Very Well Connected To Other Cities Of Rajasthan And To Delhi Too. Ac Buses And Taxis Are Available To Travel In And Around The City.